I stand at the heart of town, in the square, surrounded by stone monuments, pretty flower beds and welcoming, tree-lined walkways. In the growing months, the square is lush with colourful blooms. At Christmastime, brightly lit fir trees replace the flowers and little green and red LED trees and bells adorn the light poles. From my perch I can see straight down King Street, past its pretty brownstone shops and restaurants, all the way to the sparkling water of the harbour. Behind me sits one of the most beautiful Victorian theatres you’ll ever see, the Imperial Theatre. Across the square is the remains of the Paramount Theatre, once grand – left crumbling for many years – now just a gap-toothed space and some rubble. This is a city of contrasts. I have been here for over a hundred years and I have witnessed so much in this little square. 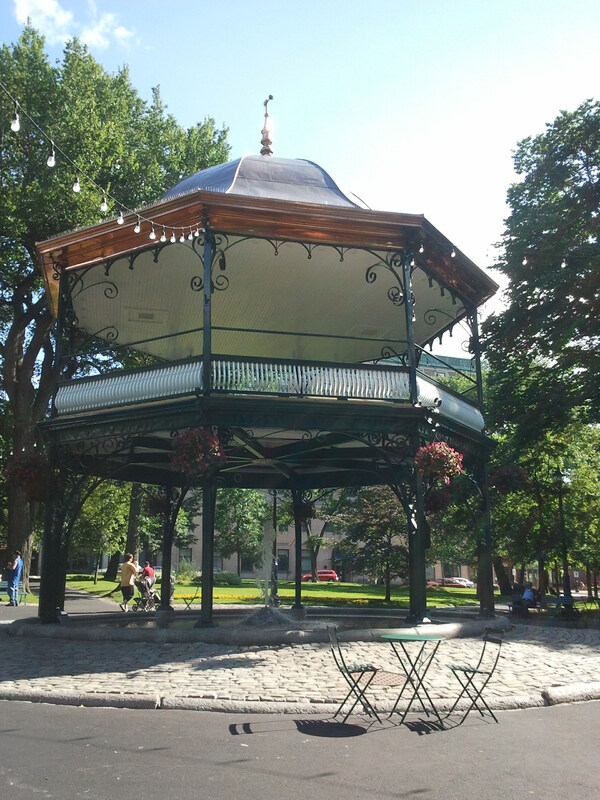 I am the King’s Square Bandstand. I have recently had a makeover. I was starting to get a bit drab, with peeling paint and a rusting rooftop. The water fountain beneath me hadn’t worked for many years. I was covered in construction tarps for many months and could see little of my beloved square. But the long wait was worth it. On the day I was unveiled, I felt like a brand new penny, with my shiny new copper roof. A new copper spire and cornet tops my roof, honoring the City Cornet Band that first gifted me to the city of Saint John in 1909. I’ve also got a fresh coat of glossy green paint on my iron arches and the fountain under me works again, creating a soothing, bubbling song. On weekends in the summer, music played by bands on my upper level floats across the square and bistro tables nearby draw people to have lunch in my cooling shadow. I have witnessed countless festivals and events over the years. Somber Remembrance Day ceremonies, now held inside because it’s too cold in King’s Square in November. But people still come to the War Memorial, surrounding it singly and in pairs, until there is a crowd. They draw near the stone structure, topped by a large angel with outstretched wings, turned mossy green with time. They come from all walks of life – it’s a city of contrasts in its citizens as well as its buildings. Some in heavy wool coats and soft leather gloves; others in dirty jeans and thin jackets, ineffective against the biting November wind. When the bell tolls, one-by-one, they take the red poppies from their lapels and place them on the monument, all the while I watch. No one told them to do that, but they do it anyway. They celebrate lives they never knew. They are fascinating and curious. They are beautiful. My whole world is this little square and those who visit it. The warm weather months are my favorite, because so many people come to visit me. Winter is cold and lonely. People rush by with shoulders hunched, coats pulled up around their chins, just passing through. I have watched this city grow and change. I have stood stoically by through war-time rallies and peaceful protests. Any important event in this town eventually finds its way to my square. Decades have passed, fashions and customs have changed but the people themselves have remained the same hard-working and humble people they’ve always been. I cannot speak to you. I know your names only when I hear them overheard. It’s a lonely life I lead but I draw comfort from helping you find solace in my quiet strength. Most of the time it’s happy memories being made around me: graduation celebrations, with shining, young faces in satin caps and gowns, emboldened with the arrogance of youth. Their parents wear proud smiles and yet sad eyes, as if they’re watching a piece of themselves slipping away. Wedding photos, with happy, smiling couples at the height of their love. And proposals, with all their hope and tears and screams of joy. I’ve seen it all. In recent years, even Zombie walks, where ghoulish creatures in white makeup and torn clothing limp slowly along, heads lolling to the side, some with their arms stretched in front of them. These are interesting times. I am the heart of noisy celebrations and quiet contemplation in this town. I watch silently as you go about your lives. I do as I have done for over a hundred years: I celebrate with you and comfort you with my constancy. In the people who have and continue to visit me, I have been able to experience life in all its beautiful and tragic aspects. I have seen the best and worst of you. I have seen your capacity for compassion and your ability to overcome adversity. You grow older, your lives change with the ebb and flow of life but I remain very much the same. Steady and true, always watching. Previous Article Remember that time we got 170 cm of snow in two weeks? Yeah, I’m trying to block it out too. Excellent first person writing. I was there. I was the bandstand.